Hats Off to Chelan Fresh Marketing 2008! Produce Marketing Association applauds Chelan Fresh Marketing on the introduction of the Fruitrition program as recently publicized in The Produce News! This certainly demonstrates your commitment to thinking outside of the box to develop innovative packaging programs that help retailers increase their bottom line. Whether it is to catch a consumer’s eye and stand out on store shelves, to protect a product in transit and extend its shelf life, or to increase efficiencies with packaging that is more responsive to today’s needs – PMA believes that good packaging should not only be innovative, it should make an impact. In 2007, PMA introduced the PMA Impact Award: Excellence in Packaging that recognized companies who were leading the way with exceptional packaging that demonstrated imagination and made an impact. More than 100 entries in five categories were submitted. 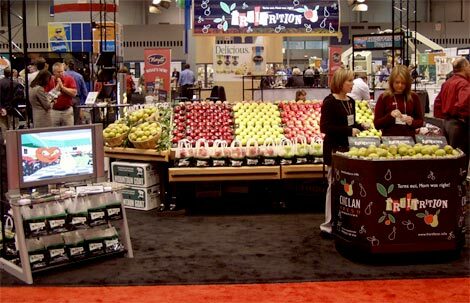 Seven companies were recognized as the best in their respective category and were honored during the Breakfast General Session at PMA’s 2007 Fresh Summit International Convention & Exposition in Houston, Texas. This year, PMAhas added an additional category to the nomination category menu and is now pleased to offer six nomination opportunities. PMA encourages you to consider participating in the 2008 PMA Impact Award: Excellence in Packaging Program. Visit PMA’s packaging website at http://www.pma.com/packagingaward/ for more information on this year’s exciting packaging program. Category finalists will have their submissions displayed in the PMA Impact Award Showcase and the six category winners will be announced at the Breakfast General Session in October at PMA’s 2008 Fresh Summit International Convention & Exposition in Orlando, Florida. We hope to see you there!